The Deluxe and Standard wall controls for your door opener listed in this index are compatible with Genie, Alliance, Norelco, Blue Max, Hercules, Lift-a-Door, Pro Max, Stealth, Excelerator, Intellicode and Overhead Door brand door openers such as OverDrive, Python, Signature, Phantom and Legacy and CodeDodger garage door openers. If you are still unsure of part or item you are looking for please Contact Us. Deluxe wall console for Genie Intellicode garage door openers Series II ONLY. 3 function console operates door opener, controls lights, and security lock out switch. Compatible with Genie Intellicode & Overhead Door CodeDodger. Three function wall console. Operates door opener, controls lights, security lock out switch. Backlit panel that is easy to locate in the dark. Sure-Lock mode allows you to lock out the keypad and remotes at night or while on vacation. Compatible with Genie Intellicode & Overhead Door CodeDodger Series II ONLY. Use as replacement for 35598R discontinued wall console. Older part number 38066R and GBWCSL2-BX. Deluxe wall console for Genie Intellicode garage door openers Series III ONLY. If you garage door opener has a serial number sticker in which the first two numbers are 10 or higher your garage door opener will operate using this Series III wall control. Not compatible with Series II. 3 function console operates opener, controls lights and security lock out switch. NOTE: In rare cases, when Genie was making the transition from dip switch receivers to Intellicode (rolling code) receiver, some Intellicode models used a 4-wire wall control. This occurred on some models made between 1995 and 1996. If you have Intellicode remote controls and currently have a 4-wire wall control installed, use 27884W wall control shown below. Deluxe Wall Console for Genie door openers built between 1993 and 1995 ONLY. Unit MUST have safety sensors. NOT for use with Genie Intellicode Series II garage door openers. 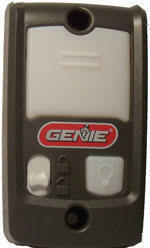 Standard Lighted Wall Button for Genie Intellicode door openers ONLY Series II. G-Mail for Genie Intellicode Garage Door Openers ONLY Series II. Wall Console-Message Center with 10 operational features: Record button allows up to a 20 second message, microphone, speaker, play button, erase button, message light, vacation lock, light control, lighted door button and low battery light. Compatible with OverHead Code Dodger. DO NOT TRY TO USE MORE THAN ONE LIGHTED WALL CONTROL PER GARAGE DOOR OPENER.